I have a problem I’d like your advice on Mom. My friend wants to give me this little dog and I don’t know what to do. You already have two dogs. Isn’t that enough? She says she’s busy and can’t keep her any longer. Look, you’re going to school full time and have to be gone from early morning to late afternoon most days. You have a part time job. You live in a relatively small condo. And dogs are social animals. They need attention. They need to pee and poop. They need exercise. How are you going to do all that? But she’s a friend in hard times and I want to help her out. Understood. But you’re in hard times too with trying to finish school and work part time. Why do you want to take in someone else’s problem when you’re up to your eyeballs with your own? Besides your friend knows your situation. If she’s really a friend, she shouldn’t even ask. Our advice is tell your “friend” thanks, but no thanks. It’s true; free advice is worth what it costs. Days later we learn she took the pooch in. As we predicted, it didn’t work out. The other two dogs, a hyperactive, out-of-control Chihuahua that should have been on Ritalin and a senile old pooch of indeterminate origin were driving the little waif to seek refuge in her crate almost twenty-four hours a day. She was living the proverbial dog’s life. Mom, I can’t keep her. She’s not doing well with the others. She sits in her crate and snarls whenever anyone comes near and she digs holes into the couch. Would you take her? Apparently the daughter would have her digging into our couch rather than hers. There was much gnashing of teeth. When I first saw the dog my heart went out to her. 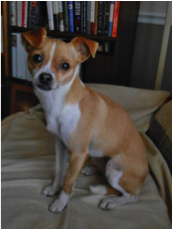 She is a light brown and white Chihuahua/Italian Greyhound mix. Her Chiauahuaness is evident in her head and tail. What is in between is short haired greyhound with the characteristic deep chest, long slender legs and lean hips. There isn’t much to her since she weighs in at a svelte ten pounds. I saw in her eyes she knew she wasn’t wanted. She seemed to plead through them. I imagined her thinking, here I go again. After I vented my spleen over the poor decision to take her in the first place I saw us enabling daughter’s poor judgement in taking her and now we were facing the consequences. Mom relented. Grumbling, we took the poor thing off her hands. We loaded her into her crate along with her food and some vet paperwork and liberated her from her dog hell. We got her set up in her new home and I began to sift through her paperwork to get an idea of her history. It is spotty and some interesting and unknown movements are lost, known only to her. Jaden was whelped in April, 2013. She was named Jaden which is a horrible name for any dog. Actually I wouldn’t even name a kid Jaden, but that’s another subject. In July, 2013 she was renamed Pumpkin and went by Punky only marginally better than Jaden. I can only guess it was a reference to her tawny coat. She somehow ended up in the Wabash County Animal Shelter in Indiana. How she got there is not known. She next showed up at the Animal House Shelter in Crystal Lake, Illinois in August of 2013 where she was spayed and vaccinated then adopted on the 18th by Tiffany, the so-called “friend” of our daughter. In early 2014 Tiffany wheedled Pumpkin/Punky onto our daughter then fled to Las Vegas. A couple months later our daughter realized she couldn’t keep Punky so we took her in. Immediately we relieved the little thing of the Pumpkin/Punky moniker. I took it upon myself to re-name her Mick. Not that she looks Irish, but more because dogs ought to be given single syllable names that can be spoken sharply without necessarily having to raise one’s voice. A quick sharp Mick gets her attention and we can go from there. I didn’t ask her about it but in a short time she responded to it so I assume she likes it. At least I believe she is grateful to be out from under the anthropomorphic Jaden that sounds like a Wellesley lit major and the Pumpkin that makes her sound like a front porch decoration in October. So, little Miss Mick has had a chequered history. She settled into her new home quickly. It didn’t take her long to “decompress”. She had to share her previous place with the aforementioned hyperactive Chihuahua and Max, an old fart, who mostly sits around tisk-tisking the out of control Pups the Chihuahua. I set her crate up in a small niche near the kitchen and family room. The crate had been her safe place and she seemed comfortable there. Very soon we discovered she had remarkably good habits in spite of having been passed around at least three times in her short life. She sits patiently while we prepare food in the kitchen and when we’re at table. She doesn’t chew the furniture. She doesn’t chew anything other than the beef knuckle bones we give her occasionally. She gets on the couch only when her towel is laid out for her. Otherwise she lies on a carpet or retreats to her crate which she thinks of as her “room”. She doesn’t sleep with us; after all she and we respect each other’s privacy. She has never done her “business” in the house. From the beginning she has been a model addition to our small family. We have welcomed her and she has responded in kind. I don’t know if someone trained Mick or if she’s just damned intelligent. But no matter. Miss Mick is a model citizen giving us much more than we expected. She knows several words. Of course she recognizes her name. She also knows Eat?, Walk?, Come!, Stay, with a hand signal, and Heel when on leash. She also has a remarkably accurate internal clock. Within minutes of eleven in the morning she sits in front of me staring. She makes for the door. Between twelve and one, weather permitting, she sits by the door for her walk. The Italian greyhound genes are calling. We walk smartly to a nearby open area on the edge of town. I let her off leash and she bolts and runs like the wind far out then around in a huge circle. If she sees a bird she gives chase. After a few minutes she slows then works back and forth a few yards in front like an English setter on the hunt. When she’s ready she looks then comes to me. I put her on leash and we return home. At four thirty she appears again, sits and stares. She goes to her dish, tail wagging. I talk to her a lot. I don’t know what she thinks about it, but she is quick to make eye contact and looks interested. I’m calm when she’s on the floor next to my desk curled into a tiny ball, sleeping blissfully. I thought I was retired, but now wonder if she sees herself as my new career. I hope so.